Juggernaut the dictionary tells, is "any massive inexorable force that advances crushing whatever is in the path". The word has evolved from Jagannath, the diety of the famous shrine at Puri, which the British could not pronounce correctly. The car (ratha or chariot) of Jagannath is such an enormous and unwieldy construction that it requires thousands of people to pull it in procession. The temple of Jagannath of Puri is situated in the state of Orissa in the Eastern Coast of India. The whole of eastern coast of India was populated with natives and the wooden image of Jagannath (a form of Lord Krishna) might originally have been a tribal shrine. Most of the tribal gods and monuments are wooden sculptures. The temple of Jagannath was constructed in the 12 the century by Choda Gangaraja (1078-1150 AD) of Eastern Ganga dynasty, of Talakad and which is in present day Karnataka. The main idols of this temple are Jagannath, his brother Balabhadra (a/ka. Balarama) and his sister Subhadra- a peculiar trinity. The festival of Ashada ShuklaDwadashi (happens to be on July 11th of 2003) is dedicated to them. A very big festival or jatra takes place and hundreds and thousands of devotees through out the country assemble to pay respects. Three thousand priests help them in conducting the various rituals. The three rathas ( temple cars) built of various trees constructed in parts from traditional tools as was done thousands of years ago. Every year new Rathas are built and after the festival they are dismembered. The parts are later used to make wooden artifacts. There is no untouchability in the temple premises. Poorest and the downtrodden can freely worship and offer the humble fare of khichadi to Lord Jagannath in earthen pots. This is the universal offering in this temple. This free and open entry has given room to the belief that formerly Jagannath was a Buddhist shrine representing Buddha, Dharma and Sangha- The Buddhist Holy Trinity. A small casket supposed to contain asthi (ashes) of Lord Krishna is inserted in the wooden body of Jagannath every twelve years, again confirming the guess that earlier it could have been a Buddhist stupa, containing holy relics of Buddha. True to Hindu tradition of Pantheon, known to absorb all cults and practices of other faiths with variations, tenets of Buddhism might have been amalgamated along with tribal traits. Trinity of Krishna, his brother and sister. The Rathotsavam (or driving of chariots) of Jagannath from the temple to sea beach is a distance of two miles. It’s a mammoth affair indeed of three huge and strong rathas with sixteen, fourteen and twelve wheels made for the occasion drawn specially at this time. It must be an Herculean task! Gandhi rightly observed that places of pilgrimage in four corners of India kept the countrymen together. These shrines common to all Hindus made them travel long distances, to interact with local people, forgetting the entire strain and travails of the entire journey. People offered heartfelt gratitude to each different deity in their own way. The temperature in Orissa at this time of year can be more than 40 degrees centigrade. And the crowd gets really heated up with holy excitement. Some old men (babu) in white cloths walk around with a water tank on their back and pump water to spray over the heads of the crowd. Read my haiku about this scene. This festival usually usheres in the Monsoon season, that brings the rains so necessary for the rural areas. Here is an old picture of the Juggernaut Temple in Orissa. 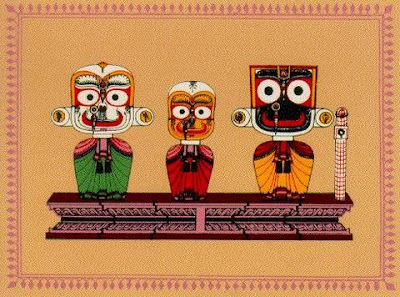 Shree Jagannatha is the "Immovable Lord of the Universe." He is a primal expansion of Lord Vishnu, second in the Vedic Trinity of Brahma (Creator) Vishnu (Sustainer) and Shiva (Transformer) and, for at least the past five thousand years, is greatly beloved throughout the Indian subcontinent. 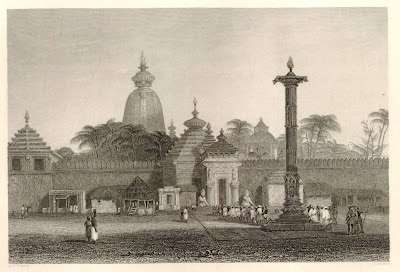 The fourth of India's four holiest temples is dedicated to Him (Jagannatha Puri). Now, thanks in part to the universal awakening of eclectic universalism in its many forms, His popularity is quickly expanding throughout the entire world. Amazing collection of old pictures from the time of the Brithsh Rajh in India and more. In modern English and American English, the word Juggernaut has more meanings, it also appears as a figure in comic books. Many modern Haiku make use of this meaning, which does not relate directly to the kigo. The term juggernaut is used to describe any literal or metaphorical force regarded as unstoppable; that will crush all in its path. is a ficitonal character in Marvel Comics' universe, a former supervillain of incredible power and durability. Juggernaut is an avatar of the extra-dimensional "god" Cyttorak. His is gifted with infinite strength, stamina, and durability, and cannot be stopped by outside forces when he is in motion. Juggernaut does not need to eat, sleep, or breathe. His armor is made of a metal found only in the dimension in which Cyttorak resides, and the helmet is impenetrable to mind-influencing effects. "ja" is a power root means life, giving birth etc. Krishna took birth at midnight on the ashtami or the 8th day of the Krishnapaksha or dark fortnight in the Hindu month of Shravan (August-September). This auspicious day is called Janmashtami. Avatara - When, Why and How? The literal meaning of the word ‘avatara’ is descent. It is no physical climb down however, but rather akin to the teacher, who, when instructing small children, has to come down to the "level" of the child, hold his hand and teach him how to write the alphabet. This is the teacher’s avatara in front of the child. A good guru too is one who first gets down to the level of his disciple’s ability of understanding and grants him knowledge accordingly. When Does God Take Avatara? Abhyutthanam adharmasya tada atmanam srjamy aham. When when (yada yada), O Arjuna (bharata), there is (bhavati) a decline (glani) of dharma and the rise (abhyutthanam) of adharma, then (tada) I (aham) manifest (srjam) myself (atmanam). Once the devatas (demigods), in order to win over the demons threatening the world, set out to churn the ocean and extract from it the nectar of immortality. For this purpose, they carried on their backs a huge mountain, intending to use it as a churning rod. However, unable to support its weight they dropped it on the way. It was then that the Supreme Person, manifesting as Lord Vishnu, came to their rescue and carried across the mountain to the seashore. Read it all in the LINK above !